Christina Firestone and Wilhelmus S.
Wellington, FL – March 4, 2015 – The Ridge at Wellington’s Turf Tour visited Tonkawa Farms to kick off the ninth week of competition. The sun shined all day over the gorgeous polo fields on the private estate. Manicured hedges bordered the property and created a tranquil setting for the horses and riders to enjoy beautiful courses designed by Nick Granat in the main ring and Michel Ismalum in the second ring. Many of the riders took advantage of the incredibly close proximity to the show grounds and nearby farms and hacked over. Conor Swail rode several horses today in the 1.30-1.35m classes and set the time to beat on his winner from earlier weeks of the Tour. Susan Grange’s Fortis Fortuna blazed around the course, stopping the clock at 31.708 seconds. This pair’s time held up for the majority of the day. Just before 2:30 p.m., Christina Firestone entered the ring aboard Graham Fletcher’s Wilhelmus S. She flew around the track, giving Swail a run for his money. When the clock stopped, there was a new leader for the $2400 1.30-1.35 m class- the time read 29.917 seconds. The second $2400 1.30-1.35m class was won by McLain Ward on HH Eli Cash for Double H Farm. The world-class athlete piloted the 8-year-old to an unbeatable time of 30.291 seconds. Ward made his jump off round look effortless, leaving out strides and wasting no time in the turns on his way to the victory. Second went to Dafnina, ridden by Diego Gonzalez Cremer for Claudia Licousi. As the last rider of the day, Diego did his best to catch Ward’s time, but fell short finishing in 31.096 seconds. Third went to Miranda Scott riding her longtime partner Quick Latinus, posting a time of 32.062 seconds. The Young Horse series, in partnership with Classic Champions, Inc., was highly successful today, with an abundance of entries into the 5, 6 and 7-year-old divisions. The 5-year-old division was dominated by Baloumerang SV, owned by Genevieve Edwards and ridden by Josh Dolan. McKayla Langmeier piloted Laney in the 6-year-old Young Jumper class to rack up another win for owner Linda Langmeier. In the 6-year-old Young Jumper Championship qualifier class, Everton, owned by Wolver Hollow and ridden by Matthew M. Matell, triumphed. The highlight of the day in Ring 2 was the $2000 7-year-old Young Jumper class. Skara Glen’s Prescence cashed in during that class, winning for owner Skara Glen Stables with Paul O’Shea in the irons. 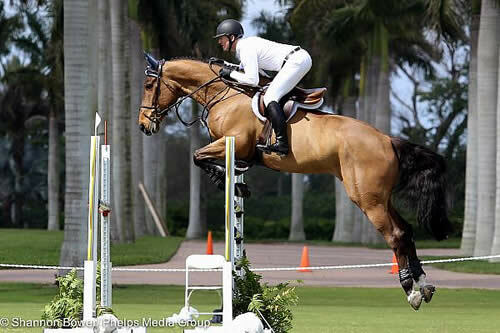 The Schooling Jumper divisions were also a popular option that had many riders hacking to Tonkawa Farms, which is conveniently located near the Palm Beach International Equestrian Center. In the Low Schooling Jumpers, Linda Sheridan won the first class aboard her own Royal Diamond. Kandice, owned and ridden by Olivia Rathgeb, came out on top in the second class. Catherine Sullivan rode Kandel to first place in the first Medium Schooling Jumper class for Iron Horse Farm. Robert McNeel rode his own Zuidam to the top of the leaderboard in the second Medium class. Friday’s events promise to be exciting, with the $15,000 1.40m Grand Prix running from 8 a.m. until 4:30 p.m. Beginning at 8 a.m., the second ring will have Low Schooling Jumpers, with two classes running simultaneously with open cards until noon. Medium Schooling Jumpers will kick off at 11 a.m. with two classes running with open cards and will run until 1:30 p.m.
Week nine of the Ridge at Wellington’s Turf Tour is taking place at Tonkawa Farms, 4150 South Road in Wellington, FL 33414. From Pierson Rd. or Lake Worth Rd, head south on South Shore Blvd. Make a right on 50th Street, and then a right on South Road. The entrance to the farm is on the right.